There is a variety of fun roulette games based on classical roulette game model adapted for fun and entertainment rather than gambling itself. Some of these games use the traditional roulette wheel but change the rules of the game, like Drinking Roulette or 'Wheel of Fortune' with its Russian counterpart 'Pole Chudes'. Other games transform the whole model of the game, but still stick to the principles of the roulette casino game, like Bauernroulette with a static octagonal playing surface instead of the wheel or Le Multicolore that may be seen as the combination of roulette and billiard. There are two variants of the Drinking Roulette game - Russian roulette (don't confuse it with the deadly Russian roulette game with a real bullet in the gun!) and Spin n Shot. In Russian roulette, the gun and the bullet are substituted with six glasses on a plate, one filled with vodka (or any other strong drink). The players are supposed to drink from the glasses in a clockwise manner. If the player chooses the glass with vodka, this corresponds to the 'Bang' in real Russian roulette. The game continues until everybody drop out but one. Snap n Shot game is basically quite similar to the Russian roulette. It is just that it actually has a spinning wheel. The ball launched by one of the players points to one of 16 different color glasses either with vodka or with pure water. The players have to drink from the glass the ball points to. "Wheel of Fortune" (just like its Russian variant "Pole Chudes") is a television game show in which the players spin the wheel to define the value of letters they name to guess a puzzle. The wheel here is divided into 24 different spaces that either have certain value on them or denoting prizes and penalties in the process of the game. For example, there is a Bankrupt space that makes the player lose all winnings accumulated throughout the current round or Prize spaces that work if the player names a correct consonant for a puzzle. The spaces (sectors) on the wheel in "Pole Chudes" TV show are slightly different. For example, Prize sector here means that the player may choose either to get a 750 points bonus or take the prize and leave the game. But still the two shows share the same principle - the player has to solve the puzzle correctly by way of revealing random letters in the word. You can also play the Truth or Dare game using the roulette wheel. The players in this fun roulette game may establish their own rules for each game. For example, red and black colors on the wheel can be associated with the 'Truth' and 'Dare' options of the game. The players spin the wheel in turns and depending on the outcome either tells the truth or take a dare. If zero comes out, the player may pass his or her turn to another person. 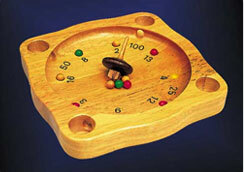 Bauernroulette is a German variety of fun roulette with no wheel. Instead there is an octagonal board with a circular playing surface. The Bauernroulette surface has numbered hollows in it and chambers outside its circumference. The spinning top moves six colored balls away from the middle of the playing surface and sends them into hollows or chambers. The payouts are defined according to the value of each hollow and to the color of the ball. This fun roulette game is actually a combination of roulette and billiard. It has both a roulette wheel and a billiard table. The wheel has 25 numbered cups of different color. The players here are supposed to guess which color cup the ball will land in. The croupier hits the ball with a billiard cue across the surface of the table right to the track on the wheel's circumference, where it stops in one of the cups. The payout depends on the number imprinted on a cup. For example, there is one red cup with a 4 on it, two red cups with number 2 and three with number 3 on them. A single blue cup represents number 24 which pays the most - 24 to 1.